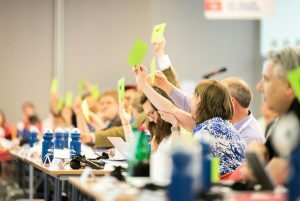 Delegates vote at a CEC assembly. Photo: Albin Hillert/CEC. The Conference of European Churches we know today looked very different in the 1950s and 1960s. At first, we were a loose association of churches, but gradually our identity and working structure emerged. A big step in this direction happened in 1964 with the adoption of a constitution at the 1964 assembly, which was held on a ship at sea to overcome last-minute visa difficulties. The fifth assembly in 1967, held in Pörtschach, Austria, created a full time secretariat starting in April 1968. The assembly approved a radically revised constitution in 1992 at its Prague gathering. The next major revision of this text came in 2013, with the adoption of a new constitution in Budapest, which was updated with the finalisation of the merger between the Church and Society Commission and the Conference of European Churches in 2014. The 2018 Novi Sad General Assembly of the Conference of European Churches finalised the constitution to bring it into accordance with Belgian law. This is the only legally-binding constitution.